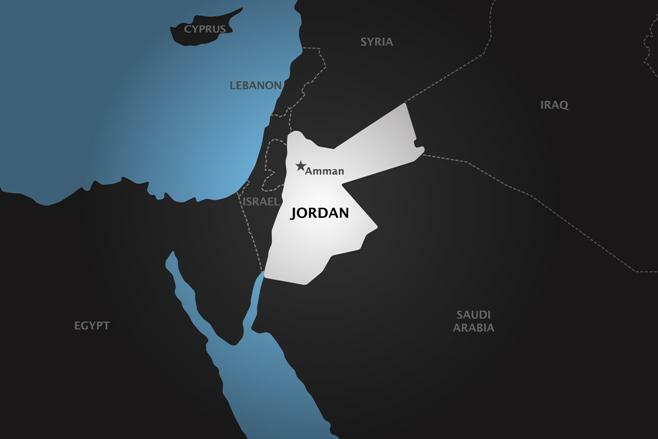 Jordan has delineated a closed military zone in the desert border regions with Syria and Iraq, in which civilians are barred from entering, after a suicide bomber killed six Jordanian soldiers near the Syrian frontier on June 21. King Abdullah II vowed to hit back with an “iron fist” after meeting top civilian and military officials to discuss the attack in an area where thousands of Syrian refugees are stranded. There was no immediate claim of responsibility, but Jordan is part of the US-led coalition fighting the Islamic State group in Syria and Iraq, and has previously been targeted by IS militants. “Jordan will respond with an iron fist against anyone who tries to tamper with its security and borders,” said the king the day following the attack. The army said the dawn bombing killed four border guards, one member of the security services and one member of the civil defence agency. Another 14 soldiers were wounded. It said the suicide bomber set off from a makeshift Syrian refugee camp in no-man’s-land near the Rukban border crossing in Jordan’s remote north. The driver entered Jordanian territory through an opening used for humanitarian aid deliveries and detonated his explosives as he reached a military post. “We will deal firmly with any vehicle of individual that moves in the area without (prior authorisation) because they will be considered enemy targets,” warned the army. The army did not explicitly say if the border with Syria would be closed. The U.S. embassy in Amman denounced the bombing and pledged “unwavering support” for the armed forces of its key ally. “We join the Jordanian people in their resilience and determination in the face of this cowardly terrorist act. The United States stands together with Jordan,” said a U.S. spokesperson. A flare-up in Syria’s war last month sparked a new influx of refugees in no-man’s-land. Nearly 5,500 arrived at Rukban within days in early May, bringing the total since January to more than 60,000. Amman insists newcomers must be screened before entering the country to ensure they are genuine refugees and not militants from IS or al-Qaeda trying to infiltrate the country. The kingdom’s position has drawn criticism from the office of the UN High Commissioner for Refugees (UNHCR). UNHCR representative Andrew Harper said he was not aware of any Syrian asylum-seekers being hurt in Tuesday’s attack. Jordan says it hosts nearly 1.4 million Syrian refugees, of whom 630,000 are registered with the United Nations. Their presence has placed a massive strain on Jordan’s economy and resources, and raised security concerns. On the day of the bombing, the Jordanian government spokesman said the country did not expect to build more refugee camps on its soil or extend those already there. According to sources close to Islamist groups in the region, around 4,000 Jordanians have joined militant groups in Iraq and Syria, where an estimated 420 have been killed since 2011.